Matching Dragoons: Weird Western Tales #23 "The Point Pyrrhus Massacre"
Weird Western Tales #23 "The Point Pyrrhus Massacre"
The story opens with two outlaws getting ready to bushwhack Jonah Hex after being pursued by him for three weeks. They lie in wait on opposite sides of a canyon. Eventually, Jonah comes riding along and one of the outlaws guns him down. When the corpse is examined, it isn't Jonah, but the other outlaw wearing Jonah's coat & hat. Hex steps out from behind a rock and convinces the first outlaw to drop his gun. Jonah then takes both men into nearby Point Pyrrhus. While in town, Jonah drops the men off with the sheriff and says that he'll be staying in town for a few days until his reward money arrives from the state capital. The sheriff mentions that the end of the week, President Grant will be stopping in town during his tour of the West. Meanwhile in Washington, D.C. at a meeting of the President's advisors we see the man with the eagle-topped cane. The man chairing the meeting explains that Grant will be touring the west to make a firsthand evaluation of the possibilities the west has to offer. The men at the table, captains of commerce they are called, will be on the trip as well to be able to advise Grant afterward. Back in Point Pyrrhus, a man inquires at the hotel as to which room Jonah is in. He walks in & finds Jonah fast asleep. Jonah quickly pulls a pistol on the man, demanding to know his business. The man is Michael Fenton of the Secret Service. He has learned of a plot to murder Grant in retaliation of his gentle handling of the South after the war. Fenton wants Jonah's help. Hex will have no part of it until Fenton makes an offer of $500. In Virginia, Solomon, the butler, brings a telegram to the man with the eagle-topped cane, informing him that their operative is in Point Pyrrhus & will murder Hex at the first opportunity. Things are uneventful in town until the end of the week. Fenton has tracked some men to an abandoned warehouse. He will bust in the front while Jonah storms the back. Jonah smashes his way into the back and finds Fenton being held by four men. The men explain that they are going to kill Grant because of his "cozyin' up" to the South. They have two men hiding in a hay wagon by the station and another two in the water tower with a gatling gun. Fenton quickly grabs one man while Jonah snatches a nearby axe, throws it, killing one of the men. During the fight, Fenton is killed and Jonah guns down the remaining three men. He grabs some dynamite in order to take out the others. As Jonah leaves the warehouse he encounters the sheriff. The sheriff pulls a shotgun & explains that he is going to kill Hex because he is being paid to. Jonah tries to reason with the sheriff but just then the train whistle is heard. The sheriff glances away and Jonah leaps forward, busting the sheriff in the jaw & then takes off running. As Jonah heads for the hay wagon he grabs a lantern and lights it. The sheriff appears and tells Jonah to freeze. The men in the hay wagon think that the sheriff is onto their plan and gun him down. Jonah then sets the hay wagon on fire and shoots the two men as they try to escape. Jonah lights the dynamite and runs across the tracks to the water tower but he is cut down by the Gatling gun. As Jonah crawls closer to the tower he manages to throw the dynamite into the tower so it explodes, killing the two men in it, just before the train arrives. Onboard the train, the President's advisor explains that they won't be stopping because the President is needed back in D.C. & the smaller towns are being dropped from the itinerary. As the train roars through town, the man with the eagle-topped cane sees the body of Hex and assumes he is dead. The townspeople appear and realize that Hex is barely alive. The town doctor orders them to get Hex to his house where he probably will die anyway. The issue closes with folks seeing the dead sheriff, assuming he killed all the men and that Hex only got caught in the crossfire. A couple of kids try to get souvenirs. This issue was on of the best. I had assumed that Fenton would be the operative to kill Hex & was pleasantly fooled. Hex is seen as being motivated by money initially, but doesn’t back down once Fenton is dead. 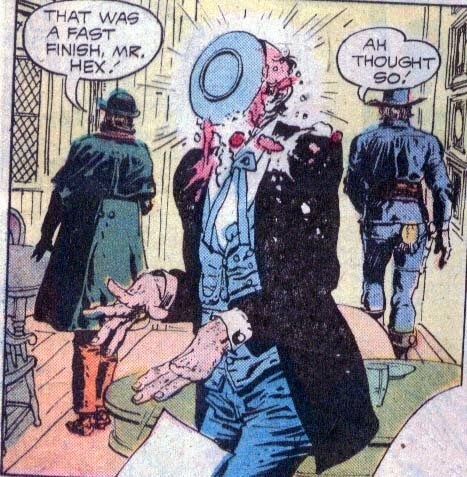 There are a few pieces of comedy with a waiter urging Hex to leave a table so "gentlemen" can use it. Jonah quickly finishes his dessert & leaves. I also enjoyed the townspeople misunderstanding what had transpired. Makes me wonder how much of history is misunderstood. On a final note, in a letter David DeWitt asks when we will see a team up of Hex & El Diablo. 32 years later in an upcoming issue of the second Jonah Hex series, that's when. I hope David is still reading. Next issue? ACTING!! THANK YOU!!! Also, Saturday, I'll post WWT #19, the first Hex book I ever purchased. "In 1873, President Ulysses S. Grant toured the west and came to visit his friend Henry Teller (who became the first senator from Colorado and later, Secretary of the Interior under President Chester Arthur) and his new hotel. To impress the President, mine owners decided to lay 26 ingots of solid silver to make a path to the entrance to the Teller House so President Grant wouldn't have to dirty his boots when he stepped from his carriage. Legend has it that Grant became angry when he saw the silver bars and walked up the boardwalk instead. At that time, Congress was debating whether gold or silver should back the dollar, and in no way would he show favortism, he said." Great Cover, great story! 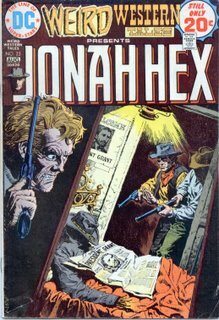 I have this story in that Jonah Hex and Other western Tales Digest. Volume 1. One of the Best!